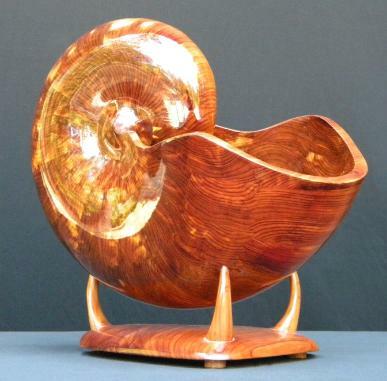 I have created a Facebook group for people interested in wood shells. Join the group whether you are a maker or an admirer. 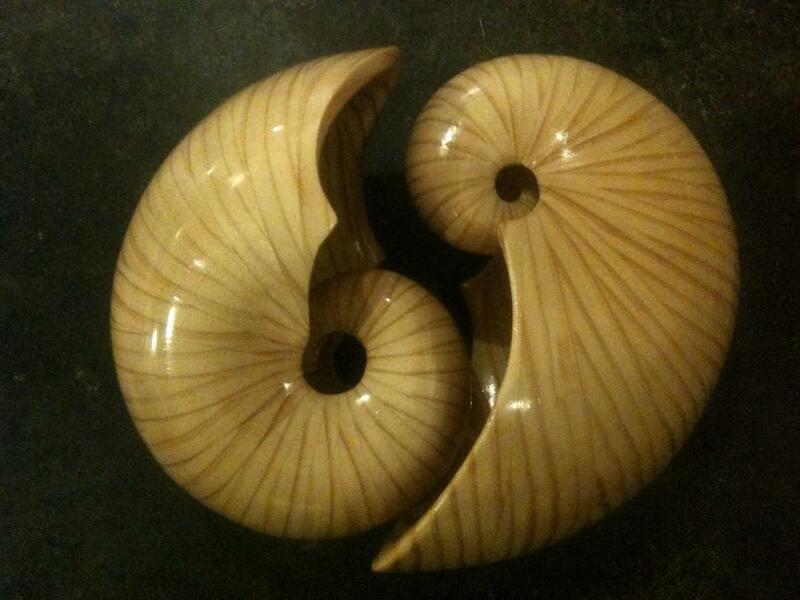 Scroll Saw Shells Facebook group. 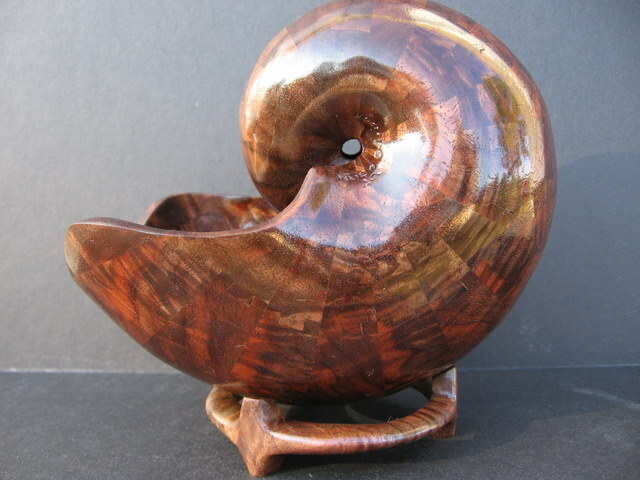 In the early 1990’s I bought my first scroll saw and learned several techniques including inlay, stack cutting, compound cutting, intarsia, inlay, and “bowl from a board”. 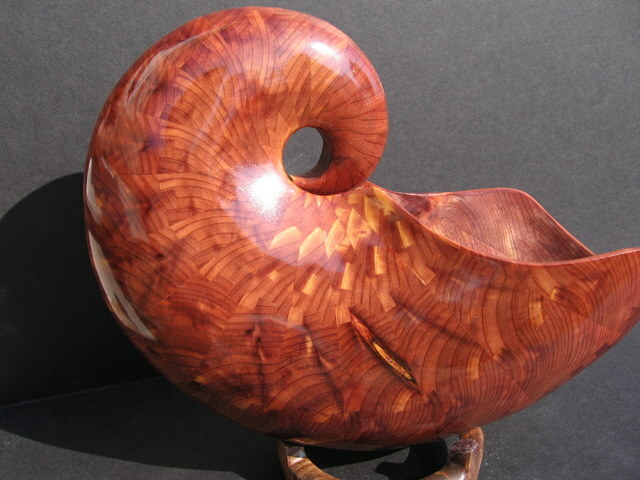 I liked the bowl from a board technique and wondered what would happen if I applied it to a board that had a tapered thickness instead of parallel faces. Starting in the center of the board I cut a series of rings at a bevel angle and stacked them together. Keeping all the rings oriented as they were before I cut them without turning them any, they stacked up to form a cone that was curved, it reminded me of a bull horn. Fascinated, I did more experimenting to see what else I could do. I found that the rings didn’t have to be round and using the ring I just cut out as a pattern for the next ring resulted in a smoother transition. It was through this kind of experimenting that I made my first “shell” that resembled some sort of seashell. 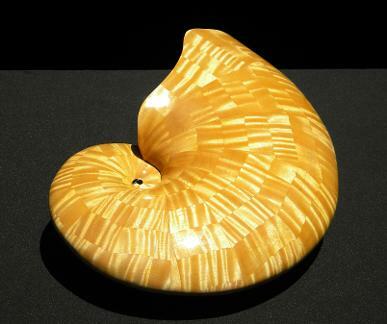 I continued experimenting by making shells with wedge-shaped blanks of different angles. I realized that the cross section of these shells is a logarithmic spiral whose angle is controlled by the wedge angle and the bevel angle. That helped me to be able to design a shell with the shape that I wanted instead of trial and error. 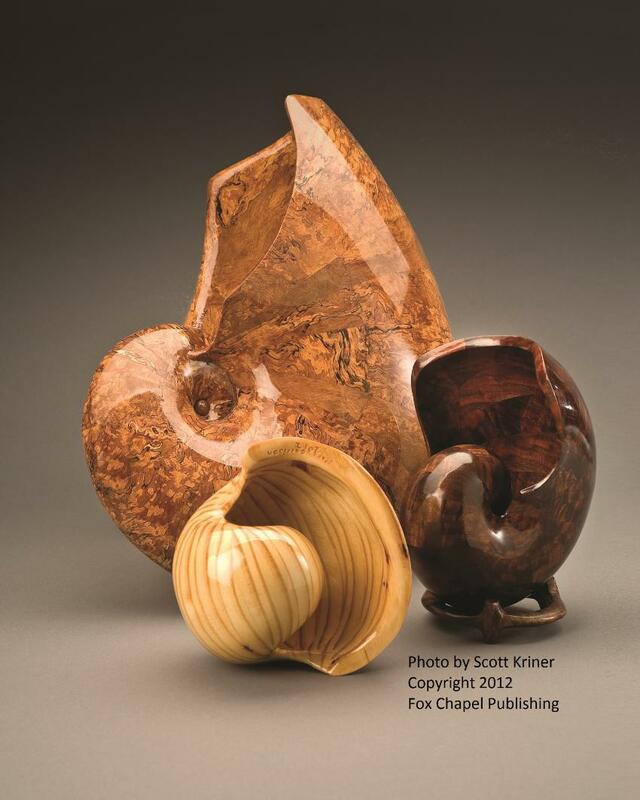 Click this button to buy the full version of, "Wood Shells - A New Art form". $24.99 A discount on your total is available when you subscribe to my email list. Please click this button to subscribe to my YouTube channel. The second eBook I have written about shells covers everything from the lite version plus it also describes a method to have more control of the resulting shell shape. 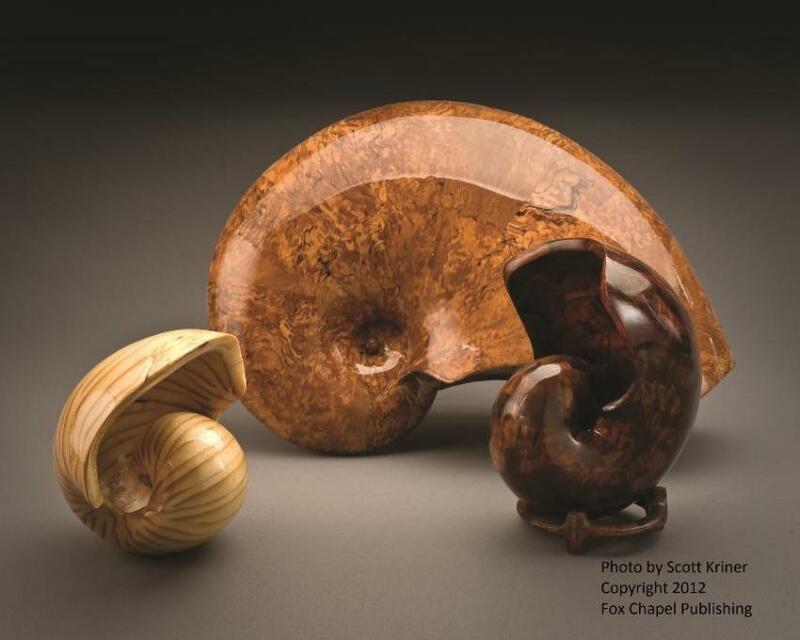 Wood shells grow in two different ways as they are assembled; I call these directions axial and radial growth. The axial growth is the width of a shell along an axis that runs through the central hole through a shell or the width of the opening. Radial growth refers to the radius or diameter of a shell. 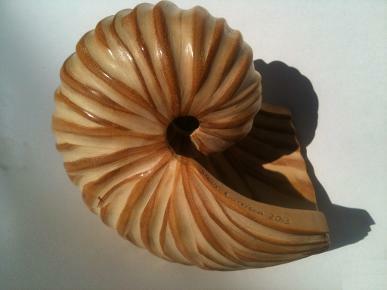 As a shell made with the basic technique becomes larger, it grows at about the same rate in both axial and radial directions. So those kind of shells will end up being about as wide as they are tall. Using methods described in the full version, we can make shells that are much narrower than their diameter. 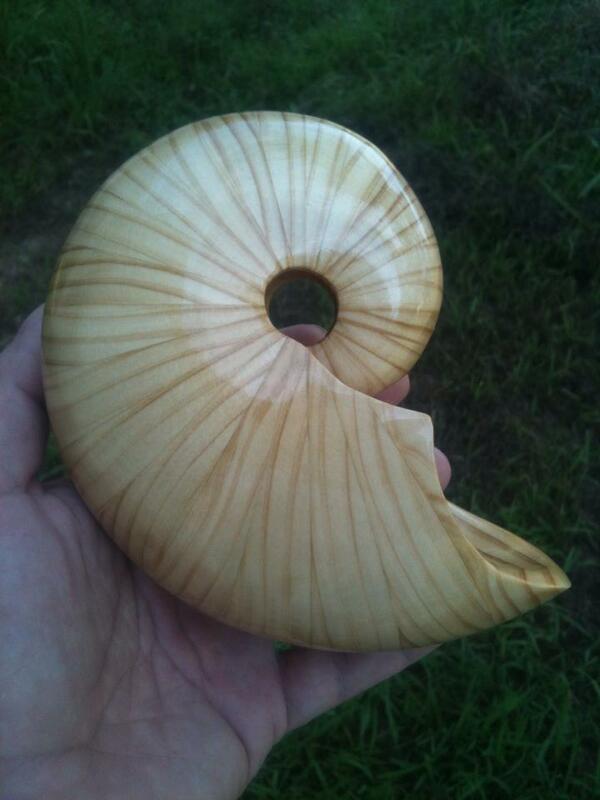 I have made a few larger shells with another method that is completely different, but I haven’t written about it yet. It might become available in the future as I learn more about it. 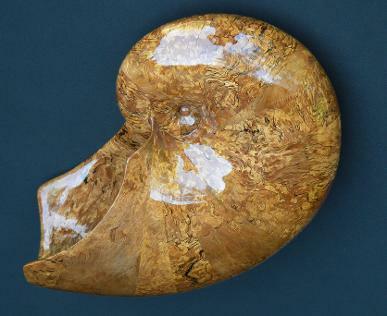 This newer technique produces shells that are shaped more like the fossil ammonites that are the inspiration for shells.